The main goal of natural flea prevention? Make it through flea season without an infestation. You want to keep flea populations at a minimum and a happy itch-free dog. Once fleas are in your house and on your dog, you’ve got a whole lot of crappy work ahead of you. Weekly flea baths for your dog, washing every bit of fabric in your house, vacuuming everything. Several times over, in fact, to make sure the infestation is completely gone. Flea prevention is a whole lot easier than trying to get rid of them once they’ve taken over. How do you prevent flea infestations and keep them off your dog? Use these home remedies for fleas and make natural flea prevention simple and easy. But first, let’s start with the outdoors. Try to keep the fleas out of your home and off of your dog so you’ll never have to use my remedies. When soil temperatures rise above 45 degrees for at least 2 to 3 weeks use nematodes to minimize flea populations. Nematodes are your best friends when it comes to keeping your yard flea-free. If fleas aren’t in your yard, they’re less likely to find their way onto your dog. Nematodes are tiny wormlike multicellular animals found in the soil. There are a lot of different kinds of nematodes, good and bad. The good ones I’m talking about here are beneficial in controlling many garden pests like ants, termites and grubs — but they also eat fleas! They can be found at many garden centers and online. I pre-order mine from Arbico Organics to ensure they arrive in early spring. They come ready to use; you just add water as directed on the package. Spray them throughout your yard using a hose sprayer or a watering can. Since nematodes are living organisms, you’ll need to use them quickly after they arrive. Apply them in the spring, summer and fall for effective coverage. Most people who know me will tell you I’m not a fan of mowing or lawns in general. However if you live in a flea prolific area, you need to keep your lawn cut short. Keep pots of lemon balm, sage, rosemary, catnip, lemongrass, basil and mint outside. Keep a few by your main doors and throughout your yard. These plants help repel fleas through the natural oils that they secrete. They’ll deter fleas from entering the house. Diatomaceous earth is a non-toxic powder made up of fossilized organisms called diatoms. They break apart flea eggs and dry them out before they can grow into adult fleas. You can purchase DE at most holistic dog supply stores, health stores and garden centers. Make sure you’re buying food grade DE only. Industrial grade DE is chemically treated and used for pools and manufacturing. Spread food grade diatomaceous earth outside in your yard wherever your dog spends most of her time. Look for places where the earth or grass is worn down from your dog’s extensive napping or relaxing schedule. CAUTION: DE can irritate your lungs so wear a mask and make sure your dogs and animals aren’t breathing the dust. After the dust has settled, DE is safe. Note: When treating your yard with garlic, just give everything one light spray. If you use it too heavily, garlic might harm some of those beneficial bugs you do want in your hard, so just give everything a light spray and don’t soak your grass or plants in the liquid. You can also make small changes in your house to keep fleas away. The best thing I ever did was remove all the carpet from my home, especially pile carpet. If carpet is a must, choose berber. Berber is the best choice for carpet when you have dogs because the weave is unfriendly to pests. If you have carpets, follow these steps. Steam clean your carpets a least once or twice a year. This can really get you off to a good start in protecting your home from fleas. Fleas love to hide in carpets, especially where the carpet meets the wall. Vacuum at least once a week in all areas. Immediately empty the bags or throw out canister debris. Once a month during flea season, spread diatomaceous earth all over and vacuum after 48 hours. Reminder: DE can irritate your lungs. Wear a mask when you’re applying it and keep your pets out of the room until the dust has settled. 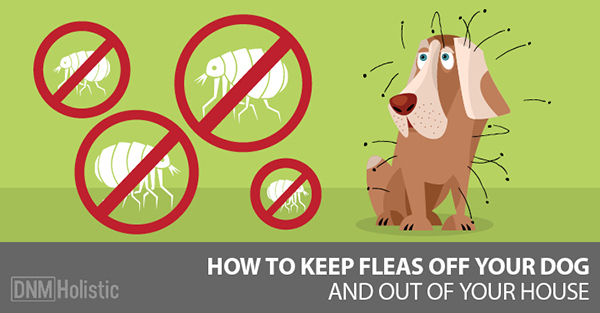 These are some of my favorite ways to prevent fleas on your dog. You can use small amounts of garlic as an internal flea preventative. Yes, garlic can be harmful if you use really huge amounts. Like the equivalent of 75 cloves of garlic for a 70 lb dog. But garlic is safe to use if you use freshly chopped organic garlic and feed the right amount. So always use organic fresh whole clove garlic and avoid garlic supplements. You can safely give your pet ¼ clove of garlic per ten pounds (use regular sized garlic, not jumbo). If your pet weighs less than ten pounds, cut a ¼ clove of garlic in half and give ⅛ clove. No matter how big your dog is, I prefer not to give more than two cloves of garlic per day. So if you have a hundred pound dog, still give her only two cloves of garlic. Start feeding garlic one month before the start of flea season. You’ll find it’s an effective deterrent in your flea prevention tool kit. Fleas don’t like a dog who’s pH balanced. Apple cider vinegar (ACV) creates a more acidic environment outside and balanced alkalinity on the inside. This makes it a must-have for flea season success. Feed your dog ½ teaspoon of ACV per day per 25 lbs. ACV contains important nutrients, vitamins, minerals, vital acids and potassium. Tip: Test your dog’s urine with pH strips before adding ACV to their food or water. Dogs should have a pH between 6.2 and 6.5. Your dog’s skin and coat should be slightly acidic for fleas to find him inhospitable. You can easily achieve this by spraying your dog each week with the following solution. Mix the ingredients in a small spray bottle and spray your dog’s coat and underbelly weekly. Avoid the eyes or any open wounds. Unless you’re willing to mix your essential oils with a carrier oil (a vegetable oil used for dilution), don’t use them. Many people, blogs and companies advocate water-suspended essential oils for fleas. This practice is dangerous. Water can’t safely disperse essential oils because essential oils are NOT water-soluble. They need to be diluted with a solvent. Chemistry is chemistry and anyone who tells you otherwise is misinformed. There are some natural substances that dissolve essential oils, but for do-it-yourself flea and tick sprays, I suggest using a thin carrier oil like grape seed oil or fractionated coconut oil. Mix one drop of essential oil to one milliliter of carrier oil. Avoid flea repellents that contain wintergreen, pennyroyal or clove essential oils. These oils are dangerous for your dog and shouldn’t be used for any reason. A note about bandanas or collars infused with essential oils: While this may be a useful idea to protect your dog when she’s outdoors, make sure you dilute the essential oils … and please take off the bandana after your dog comes inside. Here’s my favorite everyday flea treatment that’s lightly scented and very effective. Spray your dog each day when she goes outside. Pay special attention to the belly, tail, legs and ears. I live near salt water where fleas are prolific. Joy. As part of my all-natural flea prevention regimen I’ve been testing out two different chemical-free collar tags. So far, I’m amazed at how well they work. The first is a ultrasonic tag that lasts a year. The cost is approximately $45. The second tag is priced at $60 and is much smaller than the ultrasonic tag. It works with your pet’s energetic field to deter fleas. The only catch is it takes up to two weeks to reach full strength. It’s a good idea to purchase these tags in the winter to prepare for spring. Both tags are working well and I’m pleased with the results. The great thing is they don’t contain chemicals and I can use them on my cat too. Amber is a resin that formed millions of years ago. Think the mosquito in the movie Jurassic Park. I haven’t tried Baltic amber resin necklaces but I do know people that swear by for flea and tick prevention. Amber has electrostatic properties which help repel fleas and ticks. It also has a unique smell. The amber must be raw and not polished like you see in jewelry stores. Electrostatic electricity makes it impossible for fleas, ticks and other bugs to remain on your pet’s coat. You can buy amber resin collars for your dog at Amberstone Pets. NOTE: Adding the foods and vitamins below is a great way to boost your dog’s nutrition and build an unwelcome home for fleas. But starting with a fresh, raw diet is key. Dried dog food goes through high heating and processing which kills the natural nutrients your dog requires to thrive. This last recommendation is probably the most important of all. Fleas are parasites and parasites seek out the weak and unhealthy. This means if your dog is healthy, fleas will be more inclined to leave her alone! Good diet is the foundation of good health. The most important way to keep your dog glowing with good health is to feed her a diet full of fresh whole foods and unprocessed proteins. Omega-3 fatty acids (mackerel, freshly ground hemp and flaxseed). Stand your dog on moistened paper towels or a damp white bath towel. If little specks of dirt fall onto the towels and turn red or brown, your dog has fleas. During an active flea attack, wash your dog with citrus Castile soap each week followed by a final rinse with ACV. For this rinse, use one part vinegar to ten parts water. Keeping your dog’s coat clean and using a flea comb is essential to natural flea prevention. Comb from top of head to the underside of the tail, neck, underbelly and legs. Once a week, wash all of your dog’s bedding in hot water with a natural, unscented detergent. If your dog sleeps with you, make sure you throw your own bedding in the washer once a week too. Each week vaccuum your carpets and floors, paying special attention to any places your dog hangs out (along with his little flea companions). An extra diatomaceous earth carpet treatment or two can also help keep fleas from multiplying. Because the flea’s entire life cycle, from eggs to larvae to pupae to adults, can be as long as several months, you’ll need to keep repeating these steps to make sure the flea infestation is completely gone. Living the All Natural Lifestyle takes a special effort especially when it comes to your sweet pooch. With a bit of planning, you can be well on your way to a successful flea-free season without resorting to toxic chemicals.